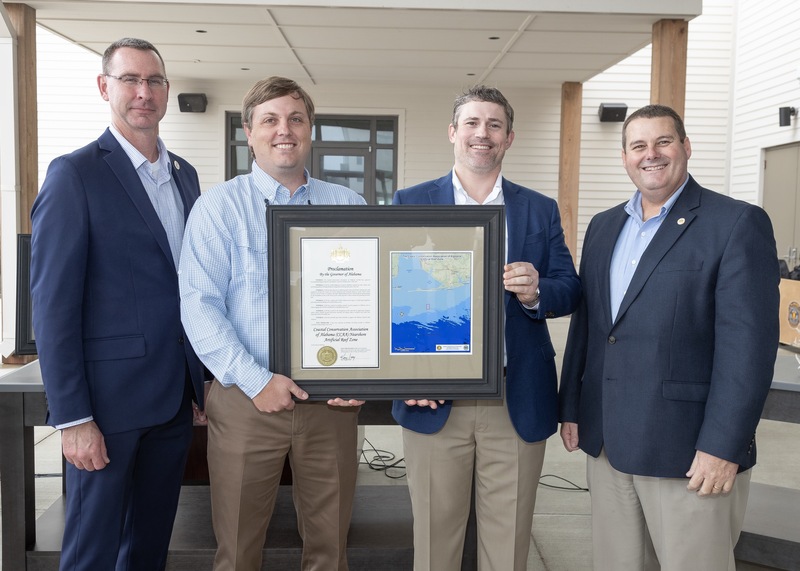 The State of Alabama, long recognized as an innovative leader in artificial marine habitat creation, recently designated eight new reef zones off its shores that will greatly expand reef habitat for iconic sport fish as well as access for recreational anglers. Located in state waters between six and nine miles offshore, the new zones add more than 30 square miles of reef zone and were named for three renowned Alabama marine scientists and several conservation groups, including CCA Alabama. Three of the reef zones that were dedicated in a ceremony earlier this month were named after marine scientists who have pioneered research into various stages in the life cycle of red snapper and the critical role that artificial reefs can play in increasing populations of this iconic sport fish. Bob Shipp and Sean Powers with the University of South Alabama and the Dauphin Island Sea Lab, and Stephen Szedlmayer with Auburn have all worked to increase understanding and access to red snapper, which under federal management has been one of the most controversial and troubled fisheries in the country for decades. Alabama currently has 27 artificial reefs in state waters and CCA Alabama has contributed partial or full funding for 17 of those. The state has already placed more than 50 reef pyramids in the reef zone to research the most effective deployments methods and CCA Alabama plans to begin deploying memorial reefs in the zone to honor prominent conservationists soon.